The values of the B767-300ER have managed to defy expectations over the years not least because of delays to various programs but even now the type has its attractions. While the values of the B767-300ER are under pressure there can be no escaping just how successful the type has been. With the development of the replacement B787 during the 2000s, it seemed that the fate of the B767-300ER was sealed. 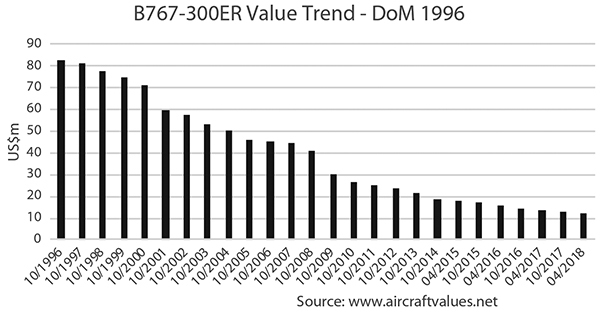 Delivery rates of the -300ER have been virtually non existent for well over a decade. But the delay to the B787 and improving market fortunes of the aviation industry, has allowed values to edge away from the abyss. At their peak, the value of a new B767-300ER was $85 million and when the B787 was launched Boeing indicated that the new -8 would cost only slightly more than the -300ER. In reality, the B787-8 was to cost 20 percent more. Values of the -300ER in the 1990s were at their highest, enjoying the replacement cycle of the smaller B767-200 as well as the securing superiority over the shorter range of the A300-600R. Even with the Asian crisis of the late 1990s, values remained reasonably stable. It was post 2001 however, that the market for the -300ER began to experience a decline that has been difficult to resist. With the drop in international travel to the key U.S. market, the values of the -300ER fell by some 20 percent – and kept on falling. The drop in new orders for the type in anticipation of the arrival of the B787 only contributed to the weakness in values. However, as delays to the B787 became more evident and because of the improvement in traffic that saw a shortage of capacity emerging, the values of the -300ER achieved a measure of stability for a time. The financial crisis of the 2008 and thereafter was expected to see values decline rapidly, particularly as Boeing had all but wound up production of the passenger version but the delays to the B787 continued to benefit the B767. Even with the hike in fuel prices, the -300ER remained in demand not least from operators keen to avoid spending millions more on new equipment. The more recent rise in fuel prices has provided further pause for thought for operators of the -300ER but the number in service and the depth and breadth of the operator base make it difficult to imagine that the type will disappear from the worlds fleet any time soon, even if the majority are more than 20 years of age.